Uisce….when she is good she is very, very good but….. I wanted to wait until shooting season finished before applying a little pressure on Uisce and starting her on the road with regards to formal gundog training. She spent the Winter being slowly introduced to everything that revolves around gundog work. She was allowed a certain freedom by just following and watching the older dogs. I stayed away from exposing her to the gunline. It was too early in her education, I felt, for her to make the connection between gunshot and birds falling. Instead we kept to the back of the drives where she could hear gunshot in the distance and follow the older dogs as they swept the area after each drive. Every dog is different in how they learn and educate themselves about the way things work and Uisce is no different. Watching her around the shoot at Shelton I could see she had no inhibitions in relation to gunshot. She was eager to enter cover and follow scent but has been slower to pick feather. 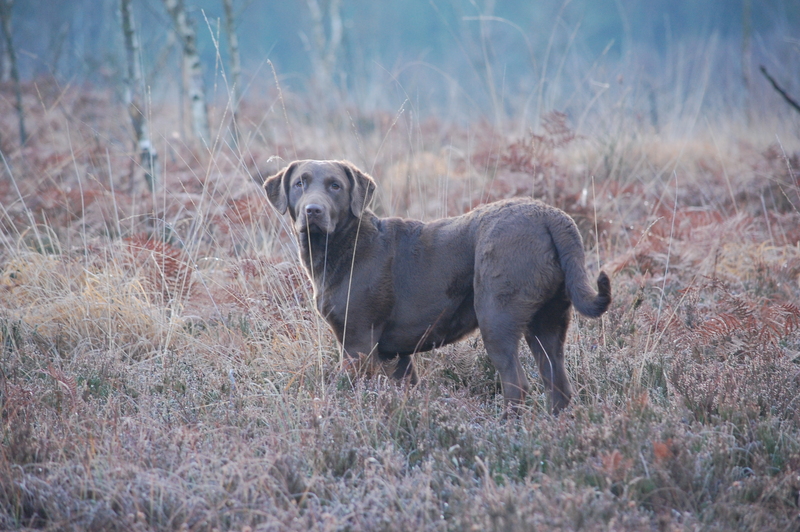 Now if this was my first gundog I would probably worry but hindsight is a luxury and one of the best working dogs I’ll ever own is Chester who only started retrieving at 18 months and another well known Chesapeake in the UK refused to pick birds for her first 2 years as a working dog. Both these dogs went on to win open level CBRC working tests in the UK. For Uisce I was keener to get the basics such as heelwork and steadiness instilled first. This is a part of training I feel I have glossed over in the past with my other chessies. They are a breed that flattens easily if exposed to too much drill work. So getting the balance right between maintaining momentum but retaining control was going to be my challenge this time round. We are now into our second week of basic training. Uisce will now loose lead walk and has just started walking to heel off-lead. I can set her on a memory land mark retrieve up to 150 meters and she is taking a perfect line. This morning I laid her first unseen and when I set her up she took the line without hestitation. Hand delivery is improving, again this is something I prefer to reel in slowly. I like them to run back quickly and parade it rather than insisting immediately on a clean hand delivery. I teach the hold command seperately which tightens up the hand delivery either way. Of course she wouldn’t be a Chesapeake unless there was some kink to iron through in her training and with Uisce, ( as her name implies ), its water……following on from her experiences last summer at the lake I spent the Winter taking her to a small river, allowing her in for a swim and then insisting on a recall before she became too absorbed in her swimming. She has improved but before I take her to open water again I need to know I have one hundred per cent success on her recall if required. To do this I have had to take her water training back a step from where I would normally start a young dog. The unnatural levels of rainwater have left almost every field in our area with their own small ponds. In most cases the water is no more than knee deep but this has been perfect as a training tool to teaching Uisce that the same focus is required in water as on land. We have started by simply walking to heel through the pond. She is rewarded with a treat if she walks quietly without trying to splash or water bite. I intend to work this up to a level where she can do walking hold and from there retrieving fluidly. So far I like what I see, there are some dogs that you walk away from a training session feeling like its been a battle. Every now and then, though, you get a dog that brings the right attitude to their work and immediately you feel that both of you are reading from the same page and each training session you walk away with a feeling of elation…I had this feeling with Bertie and now perhaps my little Miss Naughty may be quite nice….. 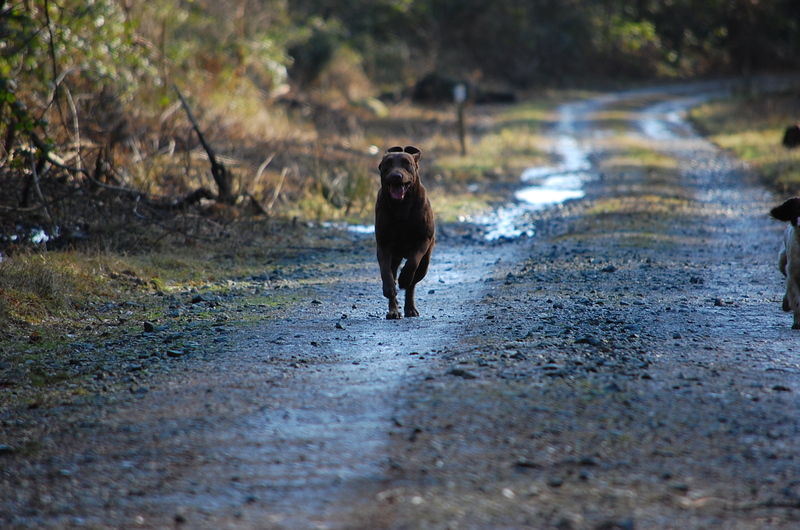 This entry was tagged dog trainer, dog training, editors, gundogs, publishers, short post, writing. Bookmark the permalink. Bran is also walking to heel off the lead. He returns immediately on the recall whistle and sits on my left side. I find that patience is the key to training these dogs and that you cant force handling. To be honest some days hes great to train but on other occasions he can really test you. Great dog and im delighted with him. Ive no doubt you will make a great job of training Uisce. Love the picture Mary !